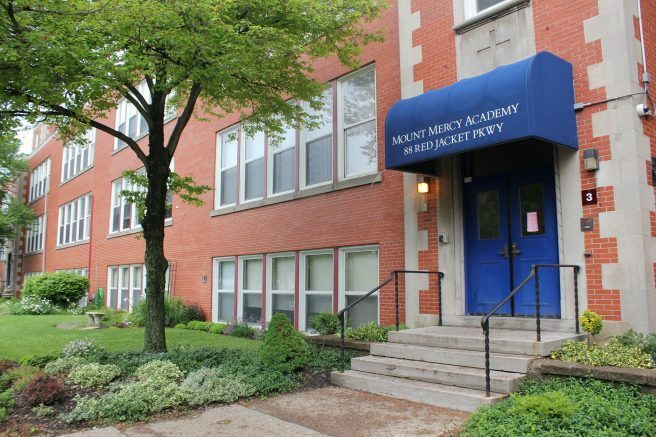 In a tradition that dates back to 2002, Mount Mercy Academy inducted 45 students as 2018-19 Mount Mercy McAuley Scholars. McAuley Scholars are students who distinguish themselves through their academic rigor by maintaining an average of 95 percent or above throughout the school year. Students who are awarded with this honor exemplify a commitment to the Hallmarks of a Mercy Education, including Dedication to Christian Values, Academic Excellence, Leadership and Commitment to Compassionate Service. McAuley Scholars pledge to live a life of integrity according to the spirit of Mother Catherine McAuley and to imitate her gentleness, compassionate service and respect for the dignity of all people. Completing the list of inductees were twelve sophomores from the Class of 2021: Lara Groves (Buffalo), Megan Jozwiak (Springville), Emily Kessler (West Seneca), Angelina Larivey (Lackawanna), Madeline Lickfeld (Buffalo), Claire Mullen (Orchard Park), Megan Quinn (Hamburg), Megan Reilly (Hamburg), Emily Rhoads (Orchard Park), Victoria Trzaska (Buffalo), Hannah Vattes (Buffalo) and Rheanna Welsh (Lackawanna). Be the first to comment on "Mount Mercy inducts 45 McAuley Scholars"